Not in their “alone time”, this group of adults are probably hunting for food. Barracudas are mainly famous and are labeled as deadly sea creatures. Recently, I had close encounter with a small school of them in the depths south of Panay Island. It was intriguing, as they didn’t quickly disappear from sight. Compared when I first saw them just few months when I become a certified diver. I watched in awe just few meters from me, the silvery group swimming coyly among themselves. It was a rare encounter! These cold-blooded fish have not only swum the Earth’s oceans for the last 50 million years, they’ve also played a leading role in countless horror films. However, the barracuda doesn’t exactly live his life to terrorize swimmers; these scaly predators prefer to spend their days hunting fish, not humans! • Barracudas vary in size, depending on the species. Largest species of barracuda can reach 6 feet in length and weigh up to 103 pounds. • Upper part of the body is covered with scales that can be black, brown, grey or blue in color. Belly is always white. Irregular dark spots are located on both sides of the body. • Barracuda has elongated body with pointed head. It has two dorsal fins and tail fin shaped like a fork. • Barracuda has very sharp, dagger-like teeth which prevent slipping of the prey from the mouth. • Barracuda’s diet consists of different types of fish: groupers, anchovies, mullets, snappers… Besides fish, barracuda sometimes eats squids and crustaceans. • Shiny objects attract barracuda’s attention. Because of that, barracuda usually hunts fish with golden or silver scales. • Barracuda is known as dangerous fish that can attack divers without any obvious reason. • Barracuda can act as an ambush predator that attacks using the factor of surprise. When there is no place to hide, barracuda will chase its prey actively. • Barracuda is nocturnal animal (active during the night). • Barracuda can swim at the speed of 25 miles per hour. This feature is useful both for hunting and for escape from predators. • Even though barracuda is one of the greatest predators in the sea, it can be prey of some large marine animals. Biggest enemies of barracuda are killer whales and sharks. • Barracuda prefers solitary life, but it sometimes gathers in groups called “schools”. 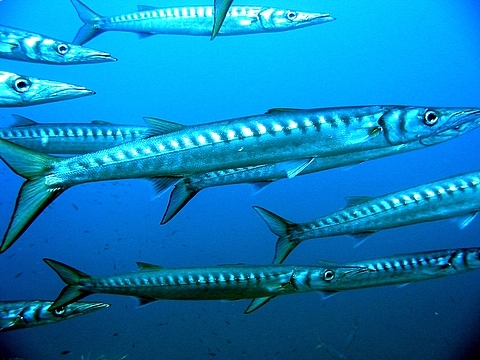 Life in a group provides safety and facilitates hunting (group of barracuda hunts cooperatively). • Mating season of barracudas takes place in the spring. Males and females release eggs and sperm cells in the water where they will combine to form fertilized eggs. Females produce and release more than 1000 eggs but only few eggs will manage to survive until the adulthood. • Barracuda’s age can be determined by counting the rings on the scales and on the otolith (structure in the inner ear). Number of rings matches the age of the fish. • Barracuda can survive from 10 to 15 years in the wild. Bargibanti pygmy seahorse (Hippocampus bargibanti) is a minute critter normally hosted by gorgonians, it was my first sighting while diving in Blue Hole of Romblon. It is hardly seen unless its host is examined closely, using magnifying glass could be better. Our DM was so keen on macro and it was fortunate we found one during the dive. This pygmy seahorse is well camouflaged, being extremely difficult to spot amongst the gorgonian coral it inhabits. Large bulbous tubercles cover its body and match the colour and shape of the polyps of its host species of gorgonian coral, while its body matches the gorgonian stem. It is not known whether individuals can change color if they change hosts, although the ability to change color according to their surroundings does exist in some other seahorse species. This is also one of the smallest seahorse species in the world, typically measuring less than 2 centimeters (0.79 in) in height. NB. Photo courtesy of Angel using Lumix TS2 with Ikelite casing. This swarm of big eye jacks (caranx sexfasciatus) was within our reach hanging in mid-water as we explored the awesome depths of Apo Island, Negros Oriental. This flagfin angelfish reigning amid a colorful reef reflects a good contrast in the depths of Tubbataha Reefs Natural Park. Tubbataha is home to about 600 species of sharks and 360 species of coral – more coral species than Hawaii, the Great Barrier Reef and the Carribean combined. NB. Photo courtesy of Angel using his Olympus Tough 8000 with PT 045 as casing.